3 Bedroom Semi Detached House For Sale in Bedford for Offers in excess of £325,000. 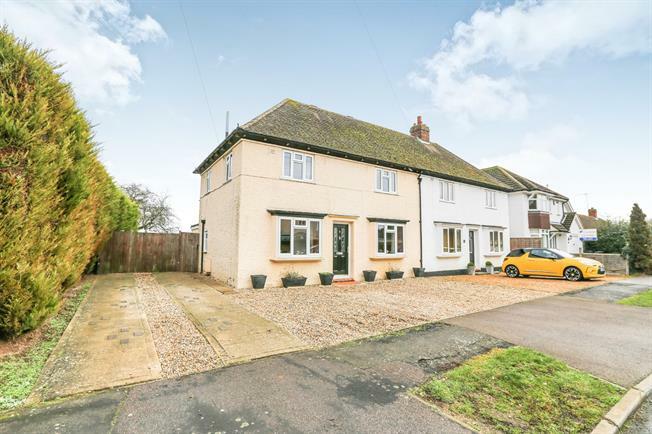 POTENTIAL TO EXTEND BACKING ONTO MILLENIUM PARK A fantastic opportunity to acquire this extended three bedroom semi detached family home, offering lots of scope to improve and extend (STPP). The versatile accommodation comprises of entrance hall, dining room, kitchen, lounge, conservatory, WC and family room. First floor comprises of two double bedrooms, study and family bathroom. Second floor comprises of another double bedroom with ensuite. Further benefits include parking for 5/6 vehicles, gas central heating, storage garage and backing onto the Millenium Park. Stairs rising to first floor, door to dining room. UPVC double glazed window to front aspect, carpeted flooring and coving to ceiling. Fitted to comprise of a range of wall and base units with work surfaces over, stainless steel sink and drainer with mixer tap, space for washing machine, UPVC double glazed window to rear and side aspect, storage cupboard. Low level WC, window to side aspect. Hard flooring with UPVC double glazed window to rear aspect. Hard flooring with UPVC double glazed window to front aspect, double glazed double doors leading to the conservatory and feature fireplace with brick surround. Door onto garden with windows to side. UPVC double glazed window to front aspect and fitted storage cupboard. Refitted to comprise three piece suite with P shaped panelled bath with shower over, wash hand basin, low level WC, tiled through out and UPVC frosted double glazed window to side aspect. UPVC double glazed window to rear aspect, study area, storage space and stairs rising to second floor. UPVC double glazed windows to rear aspect with views over double glazed window Millenium Park and fitted storage cupboard. Four piece suite with panelled bath, wash hand basin, low level WC, Bidet and skylight window. Generous size mainly laid to lawn, enclosed by wood fencing, patio area, large storage outbuilding and gate to rear leading onto Millenium Park.